Ok, ok I’ll calm down. Go get your aprons on and start your ovens. This dough does not need any chill time! Preheat oven to 325 degrees Fahrenheit. Whisk together the flour, oats and baking soda and set aside. In another large bowl, beat butter and both sugars until creamy. Add peanut butter, eggs and vanilla and beat until smooth. Slowly beat in flour mixture until just combined. Stir in chocolate chips. Place on cookie sheet by rounded tablespoons and bake for about 10 minutes. Cool on a wire rack. Or squares. Whatever you want to call them. These are SOOOO good. Obviously. Peanut butter and chocolate is the best and is my husbands favorite. Every time I ask him what he wants me to bake next, his response is “something with peanut butter.” Ok, honey. You have spoken and I delivered. I feel like this is a great bake for fall and even for Christmas. 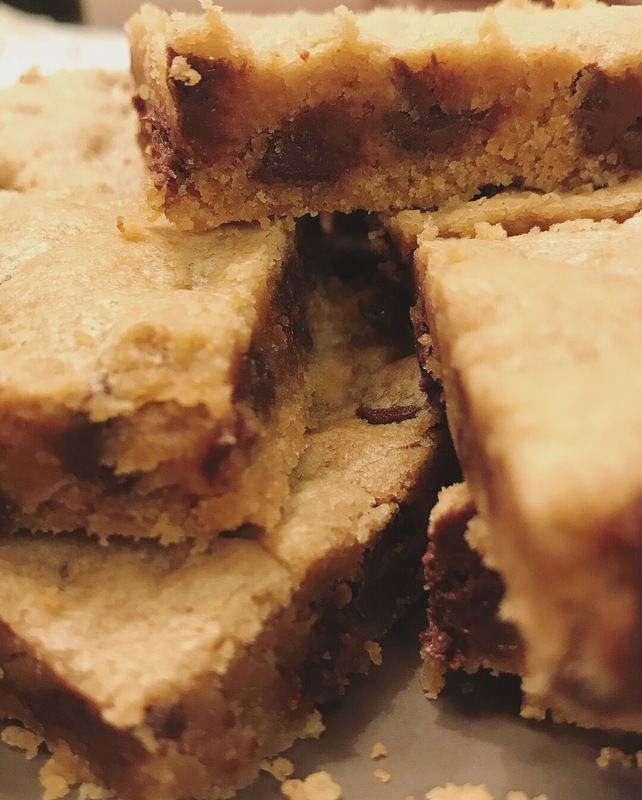 If you do a cookie exchange, definitely bake up a batch of these and add them to your dish! Yes, I’m already talking about Christmas and it’s not even Halloween yet, but us bakers like to plan, am I right?! Preheat oven to 350 degrees fahrenheit. In a large bowl, whisk together flour, baking soda and salt. Set aside. In another large bowl, beat butter and both sugars until smooth and creamy. Add in peanut butter and beat until combined and creamy. Add in vanilla and egg and beat until combined. Beat in flour mixture slowly until just combined. Stir in chocolate chips. Pour into your prepared pan and even out the top and edges. Bake for about 20 minutes. Cool completely before cutting. Enjoy! Store covered at room temp or in the fridge. These may be my favorite cookie. Peanut butter and chocolate, a match made in heaven. 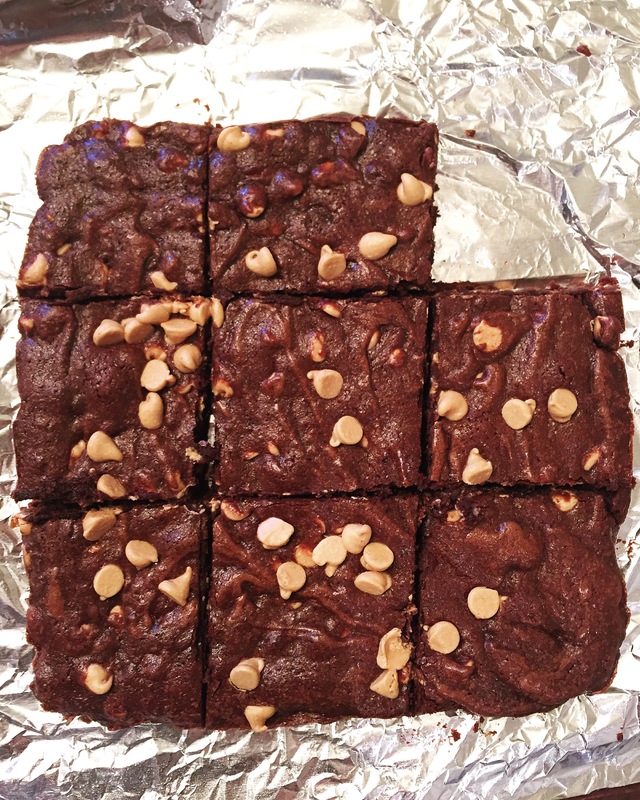 The dough is so amazing and the finished bake is a chewy, peanut buttery goodness! 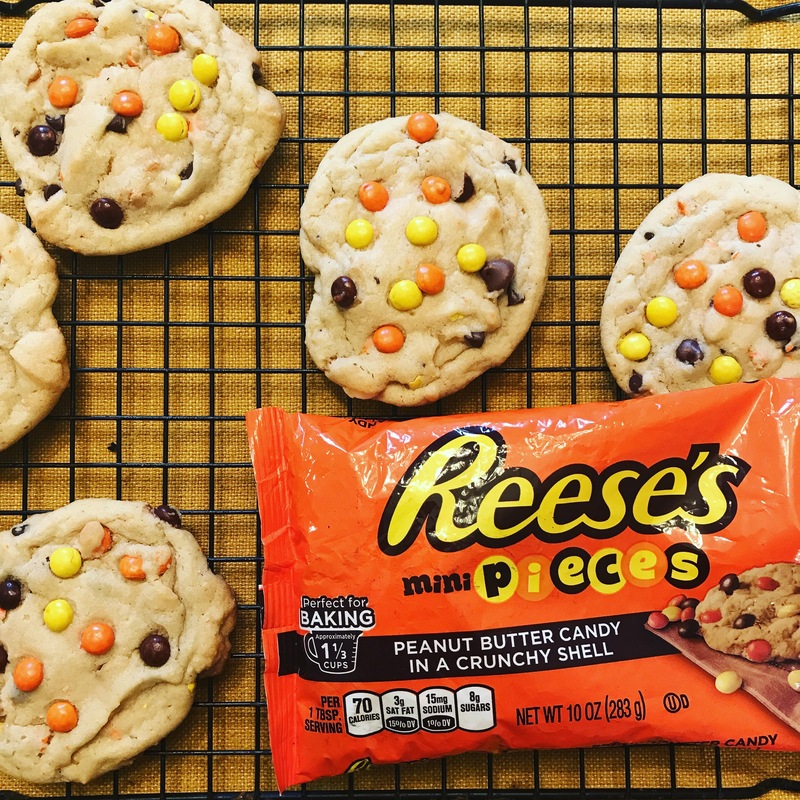 Reece’s is my husbands favorite candy so when I bake, I try to please him as much as possible so he’ll eat what I make. Otherwise, I end up eating it all! Or I have to give some to friends/neighbors. Anyway, these were a hit in our house! 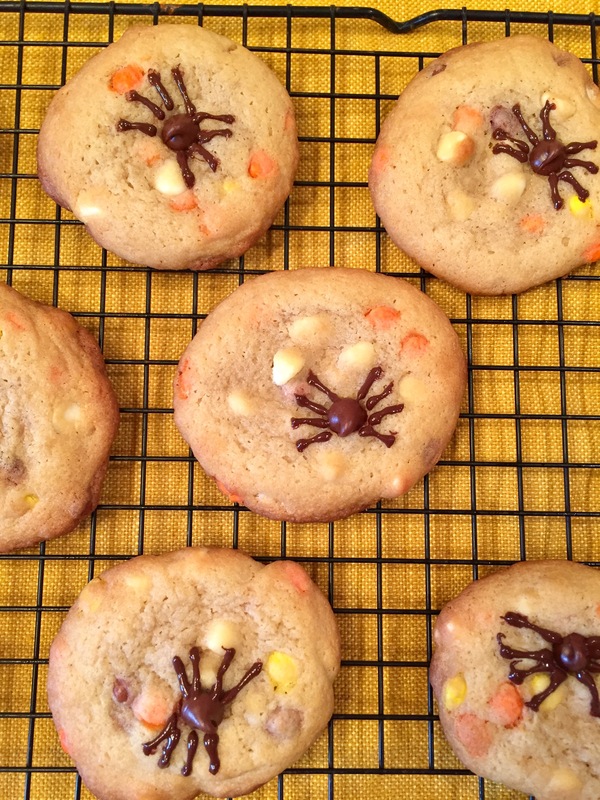 The recipe makes a lot of cookies but can easily be halved if you don’t want to make so much. So, go put on those aprons and let’s BAKE! Tip: To crush the Reece’s, just put in a ziplock bag and bang away with a rolling pin or the smooth side of a meat mallet. Preheat oven to 350 degrees fahrenheit. In a large bowl, whisk together flour, baking soda, baking powder and salt. Set aside. In another large bowl, beat together the butter, oil and both sugars until you reach a nice, smooth consistency. Beat in both eggs until combined. Beat in vanilla. Slowly add in flour mixture and beat until just combined. Stir in crushed Reece’s and chocolate chips. 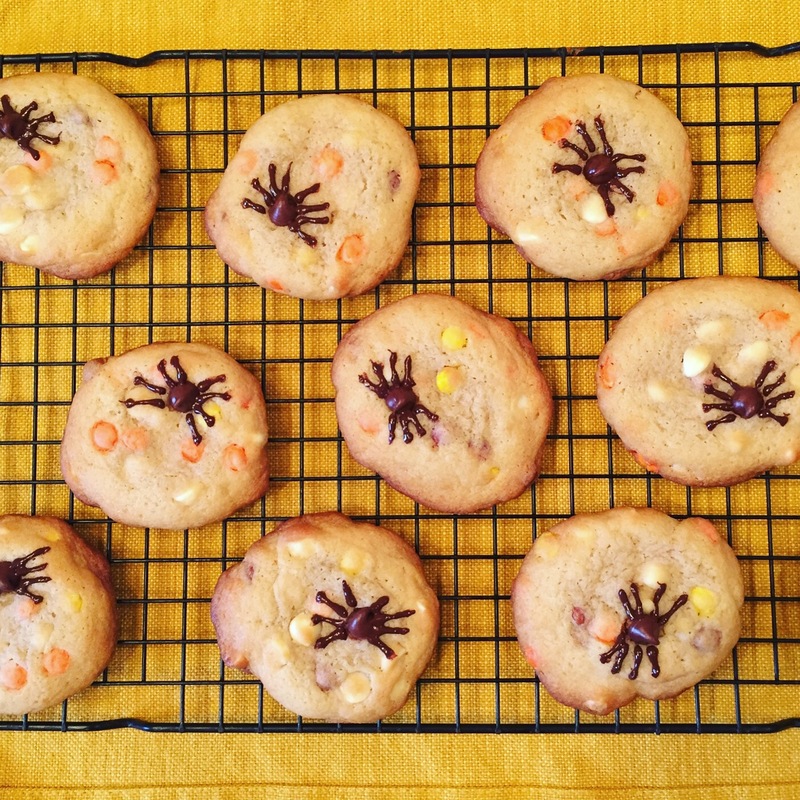 Drop by rounded tablespoons onto prepared cookie sheet. Press about 10 mini Reece’s pieces onto the tops of each cookie. Bake for about 8 minutes. I made pretty big cookies so I needed more like 9 minutes. Allow to cool for a minute on bake sheet before transferring to a wire rack to cool completely. Store covered. Enjoy! Sooooo good. Peanut butter and chocolate is never a bad idea. I felt like having a gooey brownie so at our weekly Target trip, I picked up a bag of peanut butter chips for some added yumminess. These are really easy to make and of course even easier to eat. The recipe can be doubled if need be. So, go turn on your ovens and let’s get to baking! Preheat oven to 325 degrees fahrenheit. In a large bowl over simmering water, melt the butter, sugar, cocoa powder and salt stirring constantly. Set aside to cool for a minute or 2. Stir in the vanilla. Add the eggs, one at a time, stirring well after each addition. Add the flour until combined. Fold in the peanut butter chips. Evenly pour the batter into the prepared pan. Sprinkle with a handful of peanut butter chips. Bake for 25-30 minutes. Allow to cool completely before slicing and serving. Enjoy! Store in an airtight container in the fridge or at room temp.